Nancy's print experience goes way back to her Dad, George Gormley, who started Diversified Business Systems in a basement level on Summer St in Boston, MA in 1969. Says Nancy, "You could say I have ink in my blood, PMS 185 to be exact!" As a child Nancy would go to work with her Dad on weekends and stuff the paper trim into large trash bags in the "Trim Bin". From those humble beginnings she eventually worked in all aspects of the company from the bindery, wrapping packages and stitching books to making plates and running a 2 color press. When Diversified outgrew the Boston location they moved the business to Haverhill, MA in 1975 where Nancy worked in the customer service department. After her father passed away in 1991, the company was taken over by Nancy's brother in-law Jeff Linehan and her sister Elaine. Nancy stayed on to run the customer service department and manage many of the Diversified's largest customers. 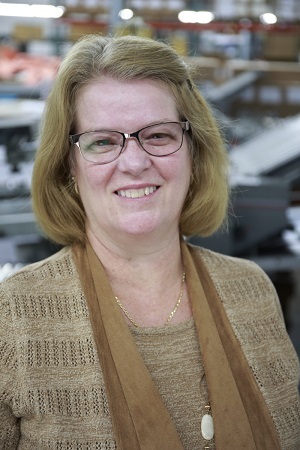 Nancy brings 32 years of print and business forms experience to Elite Envelope & Graphics. She is well-versed in all aspects of the business, special projects, state contracts, inventory management, and the everyday needs of production in the plant. You won't find many people in the industry with as much hands-on experience and knowledge as Nancy McGee. In her spare time, Nancy loves to deep sea fish with her husband Steve. "Yes, I usually (always) catch the biggest one," she laughs. You also might find her riding an ATV in the back woods of New England with her family including her 2 kids and their spouses. She's also an accomplished quilter whose handiwork can be seen in homes across the USA and in Canada.